AUDUSD is facing the resistance of the falling price channel on the daily chart. As long as the channel resistance holds, the bounce from 0.7003 could be treated as consolidation for the downtrend from 0.7295, deeper decline to 0.6950 area is still possible after the consolidation. 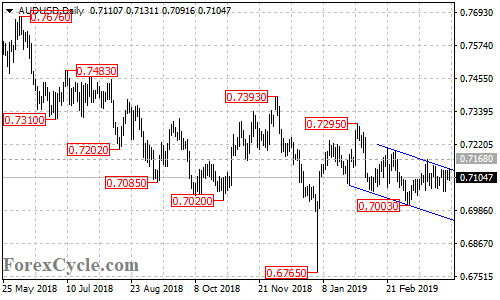 Key resistance is now at 0.7168, above this level would indicate that the downside movement had completed at 0.7003 already, then the following upside move could take the price to 0.7350 area.